TGM (Tom Gannon Motorsports) who have a long history and excellent reputation for repairing and preparing Honda (and other makes) road and race cars, have been successfully campaigning what is thought to be the only Mugen RC car currently competing in Europe. The RC, which is based on the Honda Civic FD2 body shell and originally produced by Mugen in Japan for a one-make Japanese race series, was brought to the UK by Mugen Euro Co specifically for TGM. The car has been modified by TGM in a number of areas, including using parts supplied by Mugen Euro, to make the car eligible and competitive within the Hankook 24h Series. 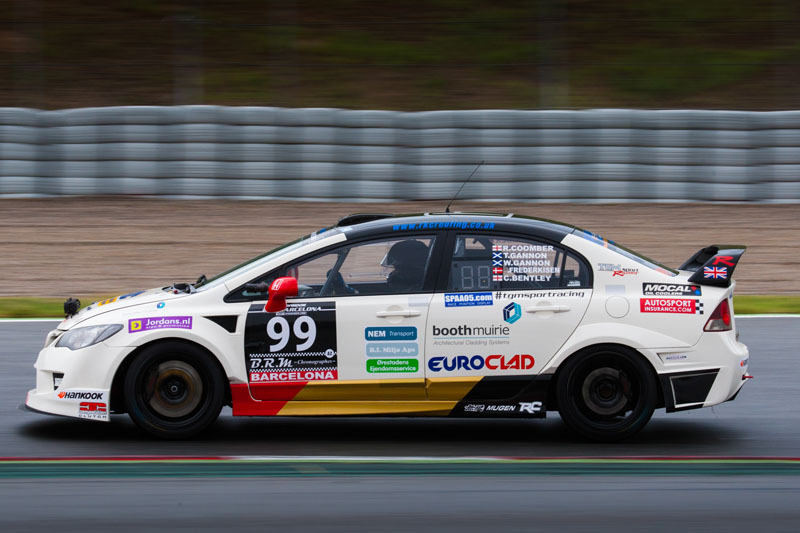 Currently lying 3rd in class in the 2015 Championship the RKC/TGM Team of T. Gannon / R. Coomber / C. Bentley / H. Bo Frederkis / W. Gannon completed 566 laps of the Barcelona circuit to finish 2nd in Class A2 at the Hankook Barcelona 24H, thus demonstrating the reliability and competitiveness of the car and engine. In addition to their racing programmes TGM are one the network of authorised retailers of Mugen retail products and have been since the official UK supply network was established. Their contact details, along with the rest of the authorised Mugen UK retailer network can be found on the links page of this website.